DHAKA, Bangladesh The garment factory in Bangladesh where a weekend fire killed at least 112 people had been making clothes for Wal-Mart without the giant U.S. retailer's knowledge, Wal-Mart said. Wal-Mart said the Tazreen Fashions Ltd. factory was no longer authorized to produce merchandise for Wal-Mart but that a supplier subcontracted work to it "in direct violation of our policies." The blaze on Saturday was one of the deadliest fires at a garment factory in Bangladesh and highlighted how the country's garment factories often ignore safety in the rush to supply major retailers in the U.S. and Europe. More than 300 people have died over the past six years in garment factory fires in the South Asian country. On Tuesday, the Bangladesh national flag flew at half-mast in all government buildings as the nation mourned the dead. The country's garment factories also closed as the government announced a day of national mourning to honor those killed in the fire. Prayers were being offered at places of worship across the country, the government said. Labor leaders hope outrage over the latest disaster will prompt change. Tahmina Rahman, general secretary of the Bangladesh Garment Workers Federation, said the government needs to do more to punish factories for safety lapses. Police said Tuesday they were questioning a woman who allegedly tried to set fire to another factory in the area on Sunday, a day after the Tazreen factory blaze. Local police chief Habibur Rahman said the woman claimed she was given money by a man to set the fire. "We have also arrested the man," said Rahman. "We are trying to find if the two have any links to the Tazreen factory fire." Government investigator Mainuddin Sarkar said they are not ruling out sabotage. 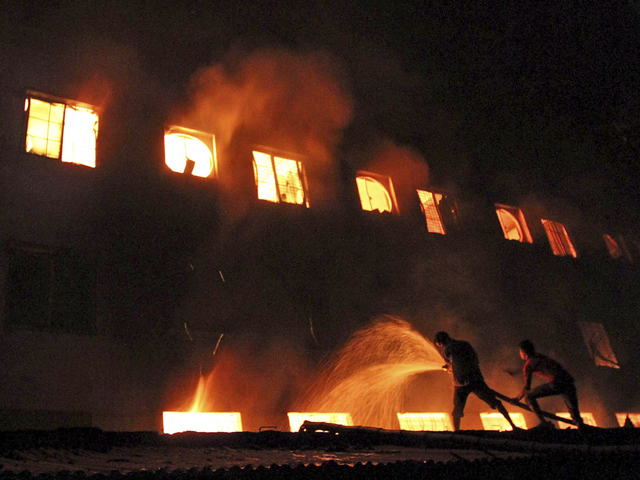 "We are looking into all possibilities, including sabotage," Sarkar said after a visit to the burned factory. He said firefighters recovered at least 100 bodies from the factory and 12 more people died at hospitals after jumping from the building. Local media reported that about 100 injured people were being treated at hospitals. The government was unable to identify many victims because they were burned beyond recognition; they were buried Monday in a grave outside Dhaka.